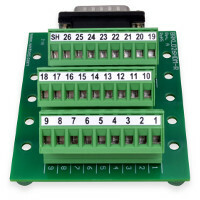 These breakout boards bring all 26 pins plus shield of a DB26HD (high density) connector out to spring/screw terminal blocks, allowing simple and quick connections for prototypes or permanent installations. These break out boards are perfect for production applications as well as for experimentation and prototype work. They are well-suited for interfacing with data acquisition equipment or any other devices that use a DB26HD connector. A breakout board is sometimes referred to as a "transition module", "terminal board", "terminal block", "breakout box", "breakout adapter", "terminator", or "interface module". Terminal rows can be independently populated before being utilized in a larger connection system. This is particularly useful when working with equipment in difficult to reach locations. Terminal rows can easily be swapped between equipment. Terminal rows can be unplugged quickly and easily for debugging purposes. Individual terminal rows can be replaced when worn from extended use, instead of replacing the entire board. To utilize this board's plugging feature, simply pull the terminal row away from its base, make the desired connections, and plug the assembled piece back into its base. Terminals can also be populated while still plugged into their base. For DB26HD breakout boards that feature fixed screw terminals, see our DB26HD Breakout Board. 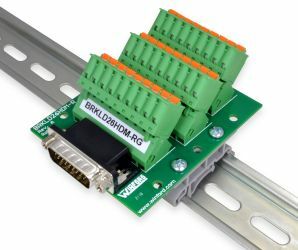 Spring Terminals (BRKLD26HDM-RGx): Spring terminals allow connections to be made very quickly and efficiently. Simply depress the actuator button on top of the terminal block, insert or remove the wire, and release the button. In addition, screwless spring connections can offer better results in environments where vibration could potentially loosen standard screw terminal connections. Screw Terminals (BRKLD26HDM-RWx): Each connection is made by turning a screw to tighten the wire in a terminal cage clamp. Approximate dimensions: 3.5" x 2.7"